Just in time for Sunshine Week, the must read document of the week, month, year is out. It’s the “high-altitude electromagnetic pulse” which Senator Dianne Feinstein (previously no foe of the Security State) has just launched at the Central Intelligence Agency. In a Senate floor speech, she accused the Agency of concealing –then deleting– documents that the Senate Intelligence Committee was reviewing about the CIA torture program. Her statement is a must read. Even the Times’ headline “Feinstein Publicly Accuses C.I.A. of Spying on Congress,” is too soft. Read the full statement here. Additionally, according to Feinstein, the CIA has attempted and failed to suppress the Senate Intelligence Committee’s access to a document she calls the “Panetta Review” of the torture program that largely (and as opposed to Director Brennan) agrees with the Senate Intelligence Committee’s findings. A previous CIA release on its torture practices. She writes: “The significance of the Internal Review given disparities between it and the June 2013 CIA response to the committee study. The Internal Panetta Review summary now at the secure committee office in the Hart Building is an especially significant document as it corroborates critical information in the committee’s 6,300-page Study that the CIA’s official response either objects to, denies, minimizes, or ignores. Unlike the official response, these Panetta Review documents were in agreement with the committee’s findings. That’s what makes them so significant and important to protect. “[F]for most, if not all, of the CIA’s Detention and Interrogation Program, the now acting general counsel was a lawyer in the CIA’s Counterterrorism Center—the unit within which the CIA managed and carried out this program. From mid-2004 until the official termination of the detention and interrogation program in January 2009, he was the unit’s chief lawyer. He is mentioned by name more than 1,600 times in our study. There of course is irony that Feinstein, who supports the NSA’s potentially illegal, formerly secret, dragnet of American telephone metadata, has launched the HEMP only after her staff was spied on and had key documents withheld and then reclassified. 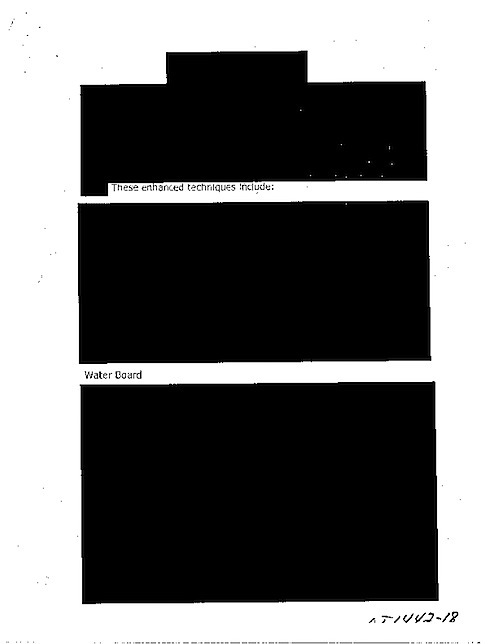 This is the disdain with which the CIA treats the FOIA requesting public every day. It is also important to note that this is not the first time that Congress has been spied on by the entities it is supposed to oversee. Just last year, in a response to a FOIA request and appeal, the National Security Archive received a NSA history revealing that in the 1960s the Agency spied on Senators Frank Church and Howard Baker (along with Martin Luther King, Jr., Muhammed Ali, and more than a thousand other Americans). The Security State’s last overreach led to the a ramped up Freedom of Information Act, the Foreign Intelligence Surveillance Act (which the NSA was able to abuse to collect telephone metadata) the Church Committee Hearings, and –my favorite– Senator Gravel’s entering the entire Pentagon Papers into the Congressional Record, for all to read. Of course, as the CIA’s FOIA office knows, there are other implications for the Agency. 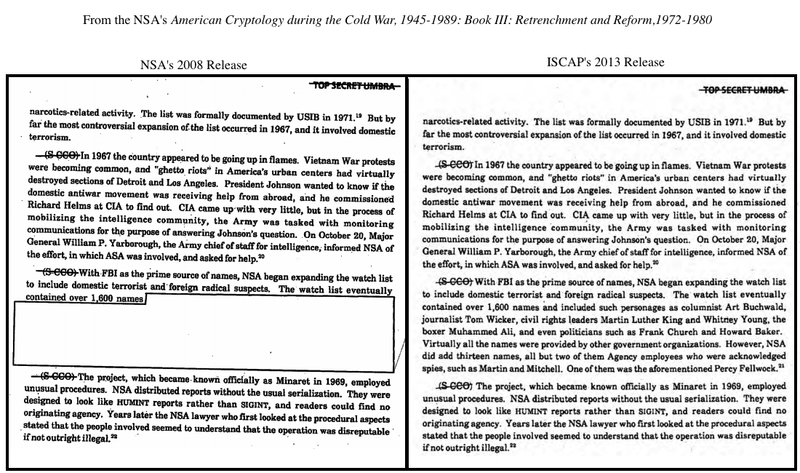 The CIA Operational Files exemption (which Congress was hoodwinked into passing in 1984, and should repeal) explicitly states that “the specific subject matter of an investigation by the congressional intelligence committees, the Intelligence Oversight Board, the Department of Justice, the Office of General Counsel of the Central Intelligence Agency, the Office of Inspector General of the Central Intelligence Agency, or the Office of the Director of National Intelligence for any impropriety, or violation of law, Executive order, or Presidential directive, in the conduct of an intelligence activity” cannot be exempted from FOIA requests. The Secret State has encroached too far. It’s time for Congress to raise the veil. ← FRINFORMSUM 3/6/2014: Battle Rages Between CIA and Senate Intel Committee over Torture Report, Conflicting Intelligence Analysis of the Ukraine Crisis, and More.